Ernest Kroll was and may still be one of Washingtons most published poets nationally. From 1945, when he sold his first poem to The Washington Post, through the early 90s, hundreds of poems appeared in large and little magazines59, in 1978 alone. His first-book Cape Horn and Other Poems (Dutton) was a runner-up for the National Book Award in 1952The New York Times listed it among the 100 best books of the year. The Pause of the Eye (Dutton, 1955), his second, was also reviewed in The New York Times and other big-time places. And yet, except among poet friends of his generation and a few others, he was virtually unknown in Washington, DC, his home since the middle 40s. Case in point: in 1982, two lines from his poem Washington, DC were chiseled in foot-high letters into what is now called Freedom Plaza, on Pennsylvania Avenue NW between 13th and 14th streets: Ernie was one of thirty-nine literary and historical eminences to be so honored, putting him in company with George Washington, Thomas Jefferson, Walt Whitman, Ralph Waldo Emerson, Mark Twain, and Abraham Lincoln. Quick in the abstract landscape of the state. Burns in the silence of the white facades. Invented city, neither Rome nor home? Ernie only learned about his hand-chiseled immortality by accident a year afterwards when he was at a friends house for a partyaccording to Colman McCarthy, who wrote a feature article about Kroll in The Washington Post, a woman came over and said he must be bored being praised, but she had to say it anyway. She loved his lines. Ernie was of course stupefiedwhat lines? This was the first he had heard about it. He wrote the Pennsylvania Avenue Development Corporation to ask how this all came about and why he wasnt invited to the ceremony a year before, when the wall of quotations was unveiled. He received a three-page letter from the committee chair, Francis Ladd of Wellesley College, explaining in numbing detail how the search committee went about its selections. She was shocked to learn he wasnt deadof course he would have been invited had they known he was still alive! I discovered that many others before meMark Twain, Stephen Crane, Dreiser, Ring Lardner, Hemingwayhad learned from journalism to stick to the facts. I learned that having to write down immediately who, what, when, where and why was the best preparation for letting the creation imagination go where it listed. WWII had begun and Ernie left his journalistic career to enroll in the US Navy Japanese Language Schoolhe graduated from the Harvard program in May 1942 and spent the war years as Commander Kroll supervising teams working in translation, decryption, and interrogationthis is from David Hays, archivist at the University of Colorado at Boulder where the papers of the Language School are housed. (In 2009, the Naval Institute Press published Roger Dingmans Deciphering the Rising Sun: Navy and Marine Corps Codebreakers, Translators, and Interpreters in the Pacific War.) With the war over, Ernie remained in Washington and for the next 25 years worked in the State Department as a Japanese Affairs Specialisthe married, had a son, and wrote poems. Many poems. He got them into the mails and while no doubt received many rejections, he had one hell of a lot of acceptances. And not just from little magazines. To a war with the sea. What is it about this and the poems that attracted such wide-ranging poetry editors? Theres no general explanation of course, though Ill hazard one anyway: his lines have a precision, an exactitude about them that ride on the back of lyric rhythms. No stunting, no razzmatazz, no wild locations but a deliberate pacing that keeps impelling you from one line to the next. Reviewing his second book in The New York Times, along with John Logans first and William Carlos Williams Journey to Love, Wallace Fowlie refers to Krolls fine sense of rhythm and the graphic clarity of this poets craft. In notes I made while reading these books again, over and over again I marked the pacing. Of gods unbuttoned and the dead. Tang of sauce, or wine, upon the tongue? Come soaring out of the north, half-starved, for you. Welcomed by birdsong from the stucco eaves. It has his being in its care. Distractedly he cracks an egg. Looks like the suns discarded shell. His pocket rich with transfers. Of birds still active in the eaves. He contemplates the scene. He sits. Is Kroll writing about himself here? Maybeonly rarely does he write poem framed by the first-person I. His poetry is both camera and mind. Expanding Universe, the opening poem in Cape Horn, begins with the visual thought that the planets are sailing into the dark and Have only their own light for mark. This leads him to an analogy about our own selves sailing into the dark: How shall we manage our one light / To navigate the perfect dark, / Lacking a mark upon the light? How shall we manage our one light  and his answers are in the poems that follow: not the abstraction of being in the world but being and seeing and hearing and touching the world in all its multitudinousness. Current poetic fashions that range from the first-person/tell-all poem at one extreme to the Dadaistic/language poem at the other leave little room for the ruminative voice such as these poems from the Fifties. That is too bad  there is so much here to appreciate and admire (a word that might be the kiss of death); but theres much for poets to learn from, especially the mindful precision. You get the idea. Theyre fast aperçusclever, playful, satiric, and each would fit on Twitter! These are poems that should be reprintedall three Fraxiom books were all published in limited editions. Ill close with remarks about my own connection to Ernie, which lasted a brief time in the mid-1970s. We had met passingly in 1971 when my wife Ann Slayton and I were living in EnglandAnn Darr and her husband George were traveling the inland waterways and they stopped in Oxford to visit; this was after I went with Ann D for a poetry reading in London that she did with Theodore Weissand Ernie happened to be there at the same time. Several years later, back in the US, Neil Lehrman and I were still publishing Dryad magazine, though we were in the process of transforming the magazine into what became Dryad Press. I had published a couple of issues of the magazine as booksthe first, Rod Jellemas Something Tugging the Line, and the second, A Tumult for John Berryman, an anthology of poetic tributes, edited by Marguerite Harris. One of the tributes was by Kroll. He later wrote me that John Berryman was a classmate and friend at Columbiaboth were protégés of Mark Van Doren, along with Robert Giroux who was in the same class. Orpheus up from hell ascending? Broken pipes within a sewer. The soul beyond the pearly gates. I read the manuscriptI read it several times at single sittings. I wanted to care for the book but didnt feel strongly about it. There were poems that seemed superb then but the 123 poems that made up the manuscript, which he had cut down from the original 150, just didnt sustain my interest. Now I know there has to be a rise and fall, I wrote him, but it seems to me there are more poems wandering around rather than heading in a coherent direction. I referred to ones that I would stand by, saying that I felt I could do a chapbook-length collection because too long a book would dilute the strength of those like Church Supper and others I mentioned. I never heard back from Ernie and dont know that I saw him in the years following. Such are the pangs of being an editor-publisher. I would love to be able to read those poems now, to see if I feel differently than I did then  maybe they were ahead of me and I hadnt yet caught up to them. The best could be put together with the Fraxioms and a solid selection from Cape Horn and Other Poems, The Pauses of the Eye, and published but uncollected poems. This would be a book of poetry I could stand up for and publish. Six Letters to an Apprentice (Thaumatrope Press, University of California, Riverside 1994). To Ernest Kroll from F. Scott Fitzgerald, Willa Cather, George Ade, Ellen Glasgow, Don Marquis, Ring Lardner. 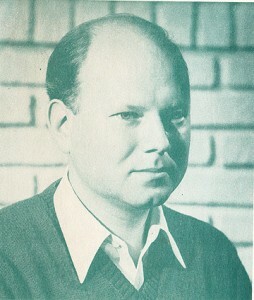 Ernest Kroll (1913 - 1995) is the author of five books of poems. He served in the US Navy, then settled in DC where he worked for the State Department.